Dolores H. (Schreiber) Duymovic, 96, passed away Tuesday, January 22, 2019. She was a resident of Mitchell and formally lived in Greenwood for many years. Dolores was born on October 15, 1922 in Chicago, IL. She married John Duymovic in Chicago, IL. They were married for 60 years. Dolores worked for L.S. Ayres for many years. She enjoyed reading the Sunday paper from front to back. Dolores loved playing games, especially dominos and bridge. She enjoyed going to exercise class and yoga. She was a great seamstress; she made everything from swimsuits to coats. Dolores also loved to crochet and paint. 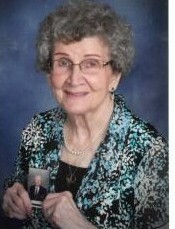 She was a member of Our Lady of the Greenwood Catholic Church for many years. Some of the activities she was involved with at church were gift bearer, donut duty, and helping with the annual fish fry. Dolores was an amazing cook. She loved spending time with her family. Dolores is survived by her children, John “Jack” (Karen) Duymovic Jr. of Portage, Michigan, Shai Botika of Greenwood, Arlette (Edward) Duymovic Stephenson of Mitchell, Mark (Charlene) Duymovic of Matthews, N.C., Gary (Shea) Duymovic of Avon, and, one sister, Lorraine Schreiber of South Bend, Twelve grandchildren, Asia, Jared, Jenaba, Sean, Aron, Zachery, Blake, Lindsey, Daniel, Laura, Michelle, and Nichol, and Thirteen great-grandchildren. Dolores was preceded in death by her husband, John J. Duymovic in 2009, her parents, Stanley and Stella Schreiber, and her brother, Irvin Schreiber. A funeral mass will be conducted Friday, February 1st at 11 a.m. friends and family may visit from 10 a.m. until time of service at Our Lady of the Greenwood Catholic Church, 335 S. Meridian St., Greenwood.